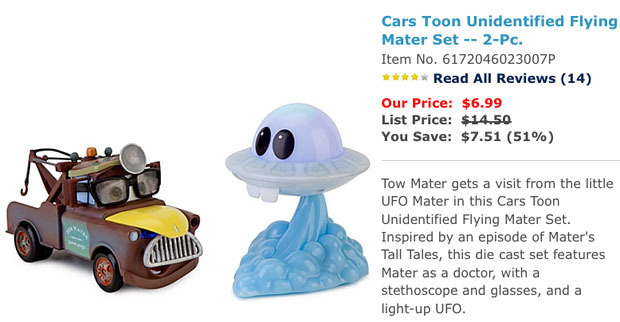 Well, the Disney Stores have beaten Mattel to the cash register punch again with their Mighty Spy Morphin’ Mater’s. Materhosen (Or Beer Me Mater) (Or What Ale’s Ya Mater) So, take off and buy me, eh? 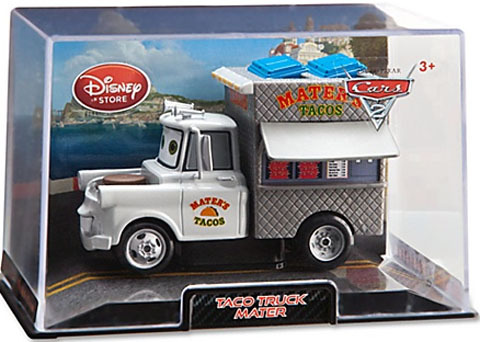 Mattel does have Taco Truck Mater & Hot Rod Mater on the schedule board. They are on sale – 2 for $12, a savings of a dollar over a regular purchase of 2. There’s not much left on sale but you can add this towards your purchase of $75 to get free ship. Both CARS light up! 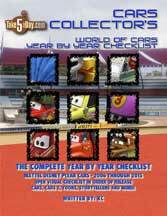 You can find all the Mater’s on one page here. Since I have virtually given up on Mattel’s distribution of Cars2 Diecasts, these will be welcome additions to my Openers Collection. Most of my more recent purchases have been from DisneyStore and include 10 (count ’em) 10 racer and crew chief pairs, (These came in 2 sets and are currently avaiable online at their regular price of $59.50 each), but previously on sale at, I believe, 40% off), also Security Guard Finn, Pinion Tanaka, 3 Kabuki Dancers, Flight Attendant and 2 Sushi Chefs (all from the very colorful Travelin’ Through Tokyo set, currently on sale at $28.99), and The Queen, Sgt. Highgear and Topper Deckington III (all from the London Calling set, currently on sale at $15.00). If Mattel ever comes across with their versions, I will decide at that time whether to pass or buy. However, in the area in which I live and shop, we have yet to see Mel Dorado, Leland Turbo, Denise Beam, Sal Machiani, Carlo Maserati, Mama Topolino or (going way back) Fred Fishbowski, and I’m not holding out much hope that any of these will ever be available here. All stores (TRU, WalMart, Target) are virtually logjammed with dozens of Finns, Maters and McQueens. So I’m very happy to have acquired the aforementioned DisneyStore versions at what I feel were bargain prices. Mattel’s offerings have, in my opinion, proven to be very frustrating and disappointing. This Dracula Mater is really nice and un-Disney Store: heavy and not tinny like their other diecast, great eyes without their Maters’ usual high lower lids, powdered-finish front end…really a showpiece. Joins their Frank, Paddy, and big Tony in my book. If you’re a monster kid you’ll love it too. The Materhosen also is first-class, it just suffers a little because of the eyes, and that big plasic hat looks really big and plastic in this scale. But if scale is keeping you from these, have a look before you pass altogether. 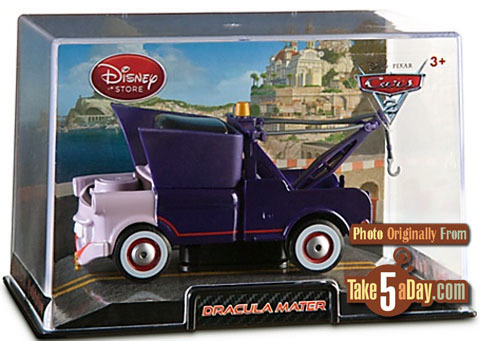 Disney: Drac Mater would look great alongside Dr. Frankenwagon’s Monster!! I just got back from the Disney Store…these are really nice, and at 2 for $12 I think they’re a great value and nice to have even as one-off collectibles if you don’t usually get their diecast. Yes, they’re hit-and-miss on QC and have the weird figure-8 pupil decals, but if you find a good one I think you’ll be happy, especially at this price. The lady there said they only got a few of each, so get ’em while you can! They also had the two-pack of Sushi Chefs, and their new Jeff Gorvette. If these were 1:55 scale, I would have already ordered them. I love the Disney Store ones too. I think they are a really good buy with the case too. I am hitting Union Square in SF today. I hope to find them. I collect both Mattel and Disney Store. It helps me deal with the lag time mattel puts us through. 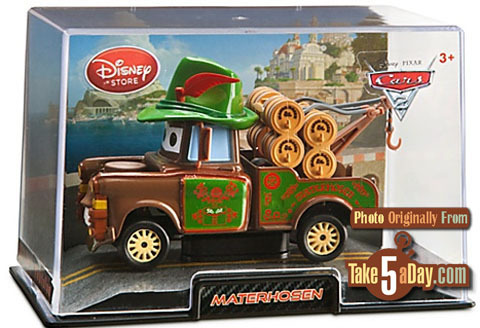 Mater looks like Marty Feldman…. Dr. Abschlepp Wagen looks like Martin Scorsese. These still have that dead eye look that the DS Maters have…straight-ahead pupils, too much hood in front of his eyes…but they’re still pretty cool. Anyone seen them in-store yet??? I’m glad for the crummy eye/windshield design, as it makes passing on these out of scale Cars much easier. As soon as I saw that scene in the movie, I knew it was a money grab to make different Maters to sell. 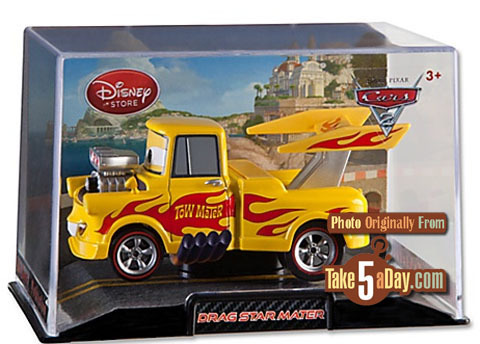 Still, these are the Disney Store larger cars which are an easy pass for us. My son like the 1:55 cars all day long. I love these and sadly Mattel have no clue as to how to satisfy a collector a fan or even a novice! If the Disney store got the size right they would sell out in a day!! Way to go Disney!! Your chance Mattel, pull ya finger out and start giving us hungry collectors something to buy, Im pleading with you…. PLEASE!! These are cool! Really like Materhosen. I wish I lived closer to a Disney store.